Regal Art & Gift exclusive! 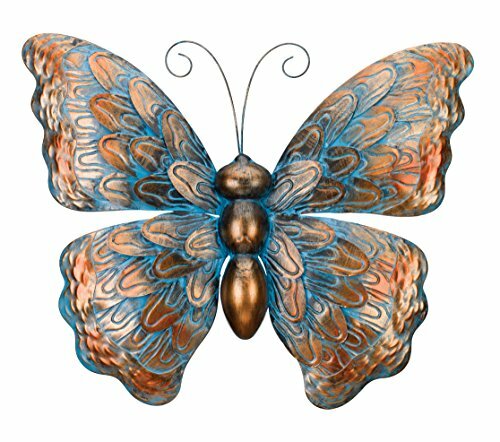 - add sophistication to your decor with this patina butterfly wall decor. This artpiece is deeply embossed, hand-painted in metallic colors & accented with rich patina hues. Can be displayed both indoors & outdoors. Makes a great gift! any variations in finish, or color reflect the handcrafted nature of our products. Any variations in finish, or color reflect the handcrafted nature of our products. Handcrafted metal patina wall decor. This art piece features layers of thick metal pieces with debossed patterns that add visual appeal. Hand-painted with a antiqued metallic copper finish that is accented with blue patina hues. Weather-resistant finish can be displayed both indoors and outdoors.